“It was really a tribute, a show of spirit and Houston Strong,” Trump said about the baseball victory. Trump welcomed Houston businessman “Mattress Mack,” members of the volunteer rescue group Cajun Navy, as well as Texan politicians Ted Cruz and John Cornyn to the event. Former Texas Governor Rick Perry, now the Secretary of Energy, also attended the event and Reps. Kevin Brady and Louis Gohmert. 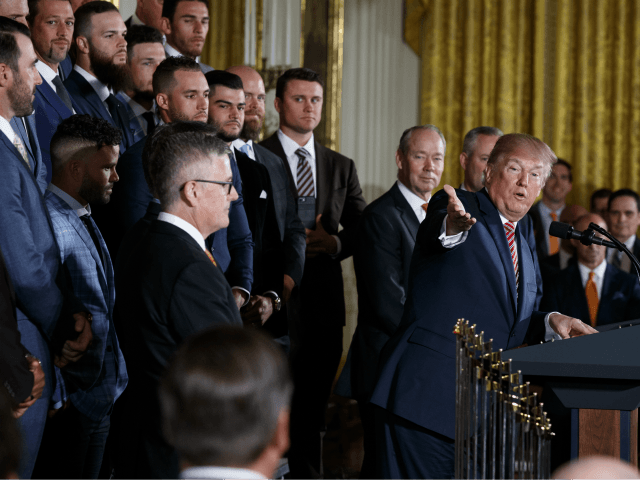 Trump also thanked Houston Astros players for donating their time and money to help the storm victims. “Our administration will continue to stand by the people of Texas, and Florida and Puerto Rico and Louisiana, even Alabama, so many places were affected and we’re standing by all of them,” Trump said.